Martin Smith believes he is settling into Irish League football as the Coleraine midfielder continues to impress on the Ballycastle Road. The 22-year-old started his career with his boyhood heroes Sunderland from the age of six and enjoyed loan spells with Gateshead United and Carlisle United. “I signed for Sunderland when I was six-years-old and I spent 14 years there,” Smith said. “I lived right beside the training ground and I left school at 16 and went full-time with the club. “I was there for five years full-time and was at Gateshead and Carlisle, but I knew I needed football so I signed for Kilmarnock. Smith knew he had to leave the Stadium of Light in search of first-team football and signed a two-year deal with Kilmarnock in 2016. “When I signed for Sunderland at a young age, it was my life as who I am as a person is because of the Club,” Smith revealed. “My whole life was spent there as I was with coaches more than some members of my family. It was a dream come true and I signed three professional contracts with them and each one meant as much as the last. “I believe in timing and I knew I wasn’t going to make the breakthrough as Sam Allardyce wasn’t interested in giving youth players a chance, so it was time for me to leave. “At the time I was thinking where was the best place to go for the next stage of my career. There were a few offers that I had to weigh up, but I knew a lot of players make the move to Scotland, before coming back to the Championship. “Lee Clark was a massive draw for me as he was from the North-East of England and he had the same values that I liked. A registration error meant a move to Limerick was cancelled at the last minute in what Smith describes as a ‘sloppy error’ by Kilmarnock and the Scottish FA. 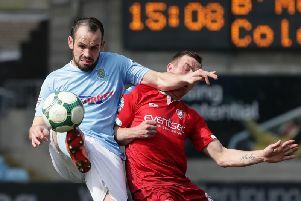 “The paperwork had to be through before July 31 to sign for Limerick and the paperwork got sent through on July 27,” Smith added. “Kilmarnock and the Scottish FA didn’t notify FIFA that I wasn’t a Kilmarnock player until August 8. “The transfer was agreed and the paperwork was submitted, but FIFA came back and said I wasn’t a free agent before July 31st and I was still a Kilmarnock player on their database. Smith would pen a short-term contract with the Bannsiders and insists he has no regrets swapping away trips to Glasgow Rangers for Carrick Rangers. “I’ve no regrets about swapping the SPL for the Irish League, especially if we go on to win a trophy,” Smith said. “There are no regrets in my whole career as it will only bring you down. “You just need to be positive, look forward and that’s what I’ve done throughout my career. “The Irish League is unique as it’s a bit similar in style to both English and Scottish football. “It would be similar in quality to the Conference or League Two and a bit similar to some matches in the SPL. “Having played in four divisions, the SPL is definitely the best standard as the likes of Celtic, Rangers and Aberdeen are technically good. The likeable midfielder has been impressed with the standard of the Irish League, but believes young footballers in Northern Ireland should follow Paul Smyth’s example to earn a move over the water. “I think if you look at the return rate of Northern Irish players going over and then coming back, it’s a very high percentage,” the Bannsiders number eight added. “It’s difficult as everyone has a different opinion about what is the right or wrong way. “A perfect pathway would be to replicate Paul Smyth as he played over 50 games, established himself and once you’re 21 or 22, you’re ready for the first-team. “If you go over at 15 or 16 you won’t be ready as you don’t have the same experience.